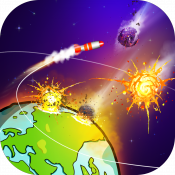 Comet Clash is a modern mix of classics such as Asteroids, Missile Command and Angry Birds! If you liked these games you will love playing Comet Clash! As a Commander of a Space Station orbiting Earth Your mission is to destroy approaching Comets in order to save the Population of Earth. Each year after the game starts an increasingly larger wave of Comets threatening Earth needs to be destroyed. How long can YOU save Earth until all hope is lost and the human race is extinct? Man the Space Stations Commander and show your friends who is the master of timing, skill, resource planning and strategic thinking!!! A new version of Comet Clash is on the way to App store! Which screenshot design do you prefer?